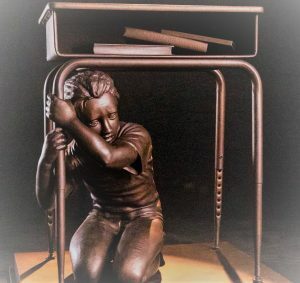 What’s better than peddling fear in the form of a 3D statue of a child hiding under a school desk, terror gripping his young face as he cowers in fear from an active shooter? Evidently, not much b ecause this is the tool they are using to generate panic among parents and students alike. “Fear-mongering” is a well-worn chapter in their political play book and they use it a lot – for one thing, it’s easier and more effective than trying to come up with real solutions. 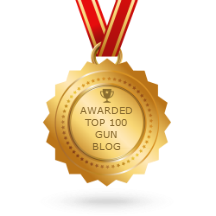 Second, fear motivates people to do all kinds of things – some positive, a lot negative, and it’s reach is far and wide, especially with the media’s anti-gun megaphone. As the school year begins, anti-2A kids are joining anti-gun organizations (i.e. Giffords, etc) to bring “The Last Lockdown Statue” to congressional districts where the sitting representative has been a consistent supporter of the 2nd Amendment. The students will rally in protest against what they see as “the gun lobby’s agenda over taking action to reduce gun violence and protect public safety.” No translation is needed for this statement – they zealously believe that supporters of the 2nd Amendment are a danger to our students. Do law abiding gun-owning citizens want to protect our youngest and most vulnerable? Without question we do. Now before anyone gets their boxers in a bunch, hear me out. Of course, they do – no one wants children to be put in harms way – no matter where one is on the political spectrum. But we can’t afford to look at this through idealistic rose-colored glasses where the bad guys pay attention to “gun free zones” and other senseless laws politicians have passed. The policies of the anti-gun left are borderline negligent, because their “solutions” to gun violence don’t yield the result anyone wants. It will put more people – kids included – in danger. 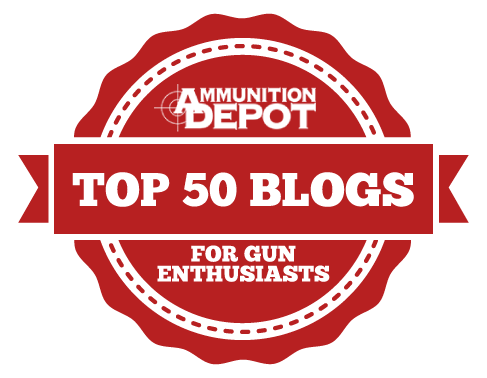 Their push for a wholesale firearms purge – for the disarming of the law abiding in the face of a world that has gone bat-crap nuts may sound good in theory, but practically speaking, it just doesn’t work. And if something doesn’t work, then why even talk about it, let alone implement it? Heck, the leftists running the anti-gun drills won’t even acknowledge that 60% of gun-related deaths are from suicide because it undermines the shock value. They won’t acknowledge that that the school shooting numbers they trot out are largely unconfirmed (check out our story on NPRs recent report on this here). And, what’s even worse is their list of gun violence “victims” includes cop killers, murderous gang members and criminals shot during the commission of an actual crime. This is repulsive and thoroughly disrespectful to the innocents who have died at the hands of law-breakers. An honest conversation must begin with, um – honesty. The thought of arming teachers to protect students brings about much hand-wringing and gnashing of teeth. With those discussions off the table as being “too scary”, some school district have come up with rather unique ideas on how to take care of our kids when they are in class. 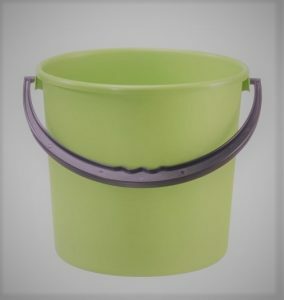 Buckets seem to be trending. Buckets in classrooms are fine – stocked with medical supplies and the like. But they are no match for a madman with a gun and GOC doubts they will provide students a sense of comfort. In yet another part of the country, the superintendent of the Blue Mountain School District explained his unconventional form of protecting the students in their schools in the event of an active shooter situation: give them rocks. Maybe all those kids touring the country with their 3D desks should bring a pile of stones with them. With such an organized and concerted effort, maybe students of America will feel safe once again. I have a real solution for gun control and anti gunners should love! If you don’t like or love guns, don’t buy one, sell it to someone who does love guns! 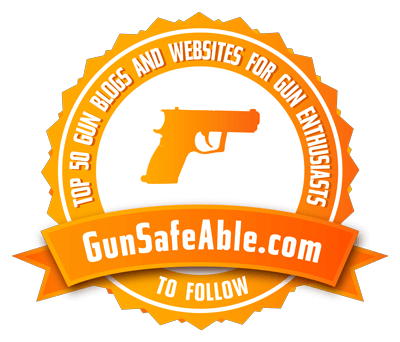 If you use a gun in any illegal way, you go to jail for the rest of your life, ! Do not pass GO! You’ll spend the rest of your life in jail in solitary confinement, no TV, no books or magazines to read, no letters from home, and you can’t write any, no phone privilege, no visitors ever, unless the guards are there to take you for your death sentence finality!